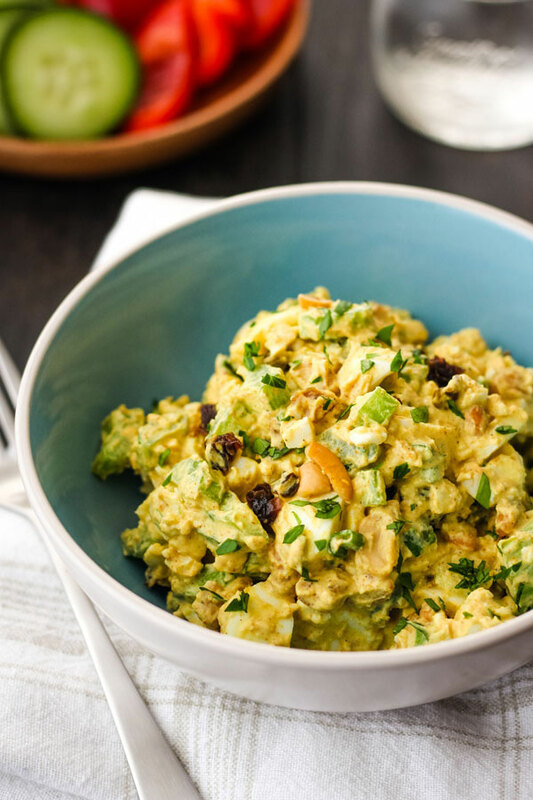 Are you a fan of delicious flavor, crunchy textures, and egg salad made without mayo? 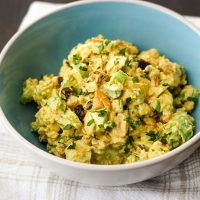 Then you’re going to love this quick and easy curried egg salad for two, it’s made with Greek yogurt instead of mayo! If you’ve tried our Sriracha Egg Salad Sandwich, then you already know we’re not a traditional eggy salad kind of house. 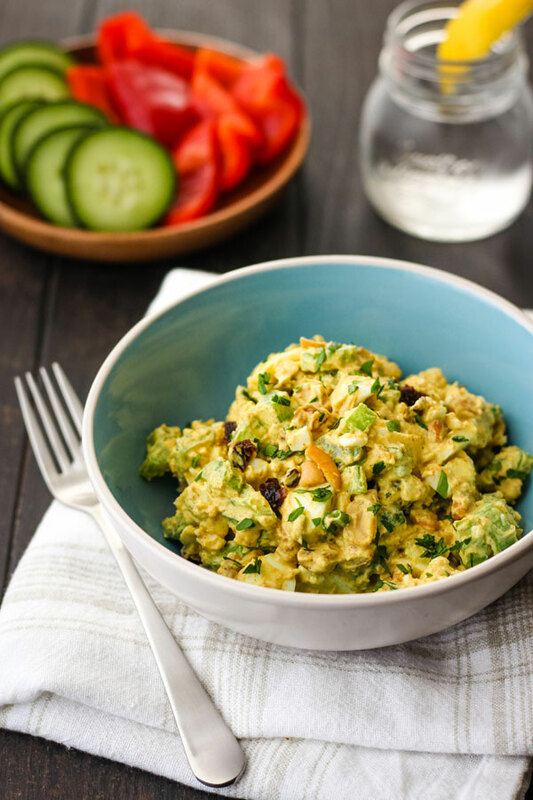 Instead, we prefer a lightened-up and higher protein version that’s loaded with flavor and lots of textures – like this curried egg salad. Curry Powder for an earthy, sweet, and slightly spicy flavor. Sweet raisins because anything curry + raisins = delish! We like to eat this salad served with red bell pepper scoops (they’re just fat slices but it feels more fun to call them scoops) or on top of thick cucumber slices. If you’re looking for a filling lunch, the salad tastes great stuffed between two slices of bread or in a pita along with big leaves of curly lettuce. 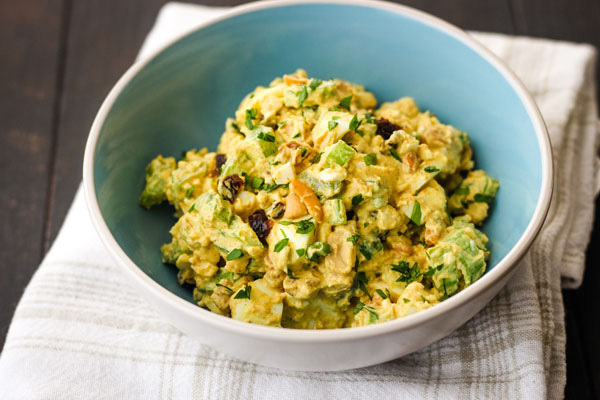 However you serve it, I hope you enjoy this hearty, protein-packed curried egg salad for two. A lightened-up spin on the lunchtime classic that’s creamy, crunchy, and loaded with flavor. In a medium bowl mix together the yogurt, vinegar, curry powder, salt and pepper. Use a fork to mash the eggs into the yogurt mixture, taste and adjust seasoning. 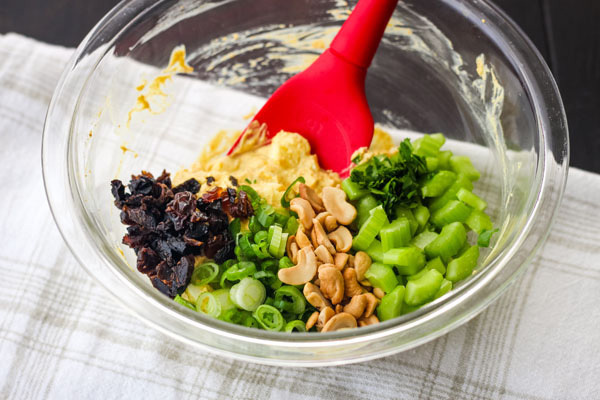 Stir in the celery, green onion, raisins, nuts and parsley. Enjoy as a light lunch served with cucumber slices and red bell pepper pieces for scooping. For a more filling lunch stuff salad into whole grain pitas or flatbreads with a handful of greens like curly lettuce, arugula, or baby spinach. 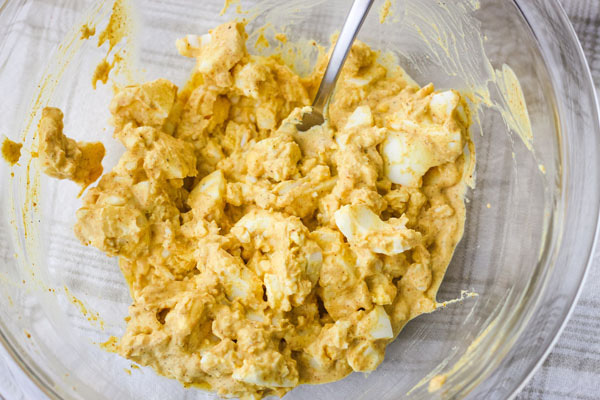 Start by making the creamy seasoned base of your egg salad. 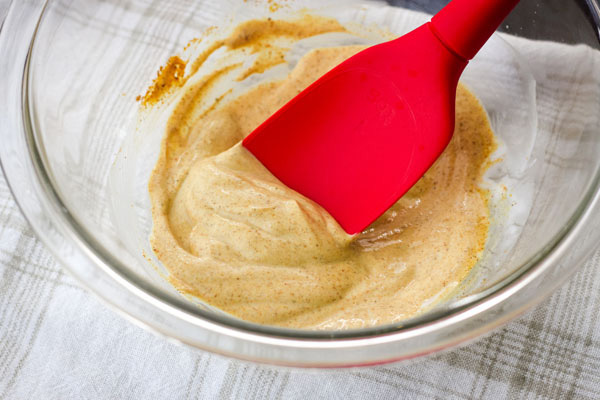 Grab a medium bowl and mix together the yogurt, vinegar, curry powder, salt, and pepper. 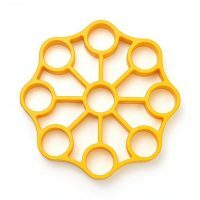 We’ve tried this recipe with and without turmeric. Tim said the turmeric version was his favorite. I could take it or leave it. So if you like turmeric, add it. If you don’t, leave it out. Next, use a fork to mash the hard-cooked eggs into the egg mixture. You could always chop the eggs if you want but I find this method gives the salad a nice contrast of chunky and smooth textures. 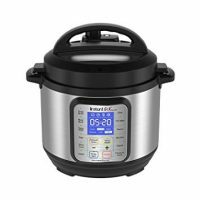 Give the mixture a taste and adjust the seasonings as needed. Lastly, stir in the celery, scallions, raisins (if I’m out of raisins I’ll use dried cranberries), and nuts. If you’ve been properly storing fresh parsley and have some in your fridge, throw it in there too. You can never go wrong adding fresh herbs, they make everything better. Now grab a pita chip, bell pepper scoop, or slice of cucumber and dig in!